Welcome to New Year's Eve 2013 - Bonza Bash Style! 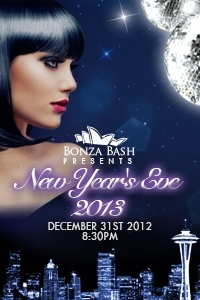 The Bonza Bash is Seattle’s signature New Year's Eve Gala Ball, complete with some of Seattle's top DJs and an 18 piece big band. We're thrilled to be bringing this year's event to Seattle's Grand Hyatt hotel - we'll be taking over the Grand Ballroom for a New Year's Eve spectacular like no other! Bonza Bash is a black tie event - gentlemen are welcome to wear a suit, dinner suit or tuxedo and ladies are invited to glam it up in cocktail or formal attire. Jeans, sneakers, shirts without collars etc... are not allowed. The dress code will be strictly enforced – this is your chance to really dress up and celebrate! The Bonza Bash NYE Gala Ball will feature KISS 106.1's DJ Tamm plus a live 18 piece big band, The Mach One Jazz Orchestra, sure to keep the dance floor pumping all night long. If you're looking for the ultimate all-inclusive way to celebrate New Year's Eve, consider our Bonza Diamond VIP offerings giving you all the privileges of Gold VIP plus hosted drinks all night, an exclusive made-to-order food menu, reserved tables and your own dedicated server - there is simply no better way to celebrate the New Year! Enjoy a specially discounted room rate of just $149/night at the Grand Hyatt - no need to worry about getting a cab at 2am or figuring out a designated driver, instead, just focus on enjoying your evening with friends, knowing that you'll be riding the elevator home :). As with all Bonza Bash events, we publish the full portfolio from our photographers at the conclusion of the event. Complimentary coat check is also included in the price of your ticket. Party favors are included for all guests! All guests will enjoy a champagne toast at midnight, courtesy of Bonza Bash! Tickets are on sale now in limited quantities. $69 for GA, $185 for Gold VIP, $350 for Diamond VIP and $1200 for a Diamond VIP table package for 4 people. Last year's event sold out 2 weeks ahead of time, and this year's event will be no exception. Grab tickets while you can! This is a 21+ event, ID required. Due to the nature of the event, all sales are final.